Our house is located on Lake Tegernsee in the bay of the former Benedictine Monastery in the southern part of Tegernsee Village. You just have to cross the Seestraße to reach the lakeshore. Enjoy the spectacular view of the western shore of the Lake and the mountain range of Kampen and Fockenstein. You can start off for your holiday activites directly at the hotel. The Yachting Club is located just opposite the Fischerstueberl. The beach/lido and landing state of the puplic boats can be reached in a few minutes by foot. You can also walk along the promenade to the city centre in five minutes. The house has a long tradition. In historical documents of Tegernsee from the 16th century it is mentioned as "Castorl Gütl". Our family has owned the property since 1894 and has run it as a restaurant since 1926. Of course the house has been changed and extended during all the time, and there is constant renovation and modernisation. 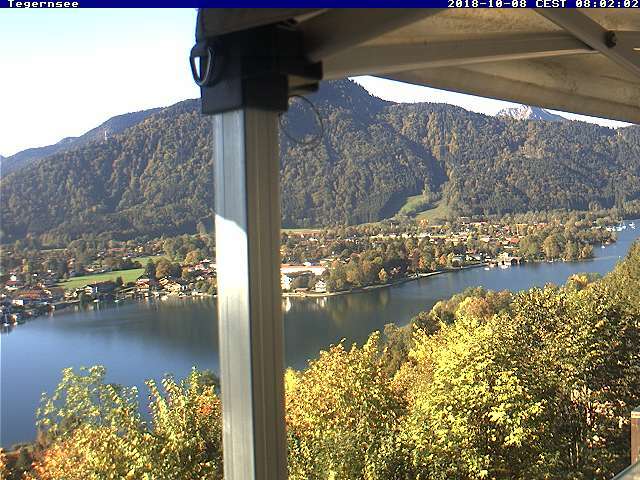 Genießen Sie diesen Ausblick auf den Tegernsee von Ihrem Balkon! Wie wäre es mit einer Bootsfahrt am wunderschönen Tegernsee? We are certified with the HolidayCheck 5.5 from potential 6 Suns Quality Selection 2018!